Ranked First Place in the entire Houston area! (Marathon Oil came in second.). Donated $711,916 in 10 years! 18 schools (10 more than last year) raised 68% of our total earnings. 11 schools raised over $2,000. 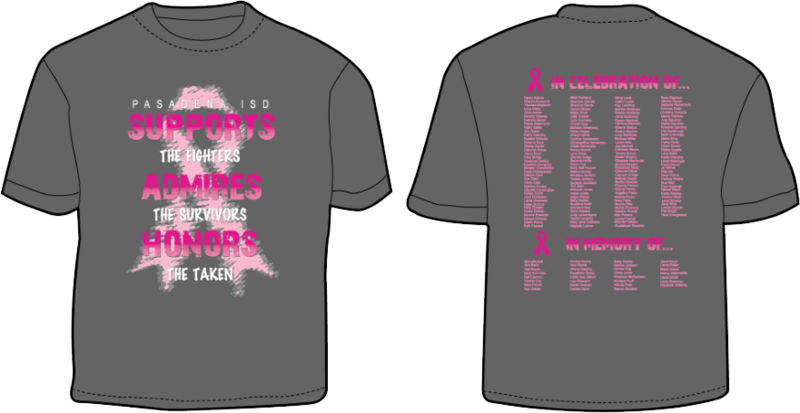 Employee t-shirts honored 164 employees, 132 survivors and 32 women who have succumbed to the disease. $29,076 (increase of$5,928) was cleared from the sale of 4,543 district-wide t-shirts (increase of 857):2,541 employee T-shirts (increase of 164) and 2002 student T-shirts (increase of 693). 21 schools sold$500 or more for the sale of adult T-shirts. 8 schools sold $1000 or more for the sale of student shirts. All of our campuses, except 3, participated and 13 departments participated in raising money from Passionately Pink Thursdays and a variety of fundraisers. Forty schools raised more than a $500! Gulf Coast Federal Educator’s Credit Union raised $1,000 for our team!